Look at the gorgeous knits my friends have created for Aviator Ball auction benefiting the Tulsa Air and Space Museum & Planetarium! 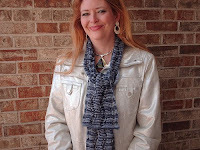 The Eclipse scarf was created by Eaglechic, also known as Gina La Ninja at Loops. 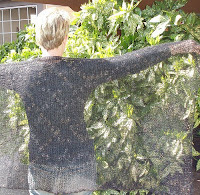 It was made using Tempted Eclipse hand-dyed yarn -- with real silver spun into it. The Midnight Sky shawl was a labor of love (emphasis on "labor"), created by MrsD and modeled by the crafty Colorcrazed (also known as My Pfriend Phara). Thanks, thank you, MrsD! Colorcrazed is creating an auction item of her own -- an OU Illusion scarf. Many other people have knit up some fabulous items for the auction and I will post them as I get more photos. Want to attend the auction or bid? Call 1-918-834-9900 or visit TASM.